When every single one of your bookish friends is raving about a book, you know they can’t all be wrong. That’s how I felt about When Dimple Met Rishi. Everybody I know that read it, loved it. I honestly have not seen one single bad review for it. In all my years blogging, I feel like I have never seen one book get so much praise. I obviously had to pick it up to see what all the fuss was about. 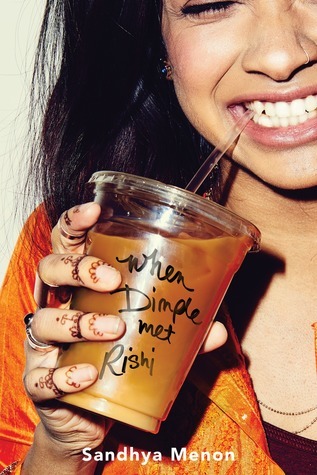 When Dimple Met Rishi is like the perfect romantic comedy in book form. I haven’t been reading much contemporary lately but that’s because I stopped finding books like this one that reminded me of my love for the genre. This book had everything that made me love contemporary YA novels growing up: romance, friendship, conflicts, confusion, family, and so much more. Dimple and Rishi are far from perfect and that’s why they are so dang lovable. And don’t even get me started on their friends and families. The family dynamics between both the parents and children and the children and siblings may have been my favorite aspect of this book. So often it seems like family can get overlooked in favor of romantic relationships in books but that’s not the case with When Dimple Met Rishi. Sandhya Menon perfectly balanced every aspect of this book. What made the family dynamics so awesome though were the characters. Dimple and Rishi are obviously the main focus of the story but their story couldn’t have been told without their families and the friends they made at Insomnia Con. Dimple’s family was very traditional and it was easy to see that her parents wanted a traditional life for her. The love they had for Dimple was clear but her mom couldn’t see why Dimple wanted something more out of life than marriage and children. As for Rishi, his parents were of a similar mindset but it wasn’t such an issue because it’s also what Rishi wanted. From the start it was clear that Dimple and Rishi were looking for different things out of life but that didn’t really stop them from falling for one another. Also, Celia (Dimple’s roommate) and Ashish (Rishi’s brother) kind of need their own story now. I want to know more about those two. As for Dimple and Rishi, they were pretty great. Dimple was a little hardheaded and she definitely did some stupid stuff but I still adored her. Rishi was almost too perfect. He was so incredibly sweet and loving. He was a total romantic and while his and Dimple’s personalities didn’t seem like they would go well together, they really did. Rishi brought out a softer side in Dimple and Dimple pushed Rishi to go after what he really wanted in life. Overall, When Dimple Met Rishi deserves every bit of praise it’s been getting. Sandhya Menon has set a very high bar for herself but I am sure that whatever she writes next will meet that standard. I haven’t read one negative review for this one yet! I just ordered it on Amazon a couple days ago. I can’t wait to start it! Great review! Oh, I really enjoyed this one as well. So very sweet. Great review! I’m hoping I can get to this one soon, I’ve heard nothing but great things! I <3 this book so much. Loved every second. Added it to my favorites shelf, and am overjoyed with the synopsis for Menon's next release. Great review! I haven’t read this one yet, but it’s on my tbr list. It sounds fantastic from all the reviews I’ve read. I loved this book so much. Can’t wait for From Twinkle, With Love! Sounds awesome. I should read it for sure! Amazing review! I entirely agree with every word of it, this book is one of the few in the genre that I’ve just absolutely loved. I’ve heard lots of great things about this one. It sounds — and looks (love that cover!) — super cute. I definitely need to get my hands on a copy of it! I was the same, I had heard so many good things about it and so knew I had to read it. It was a really enjoyable read, I can’t wait to see what this author creates and writes next. How many stars out of 5 would you give it?